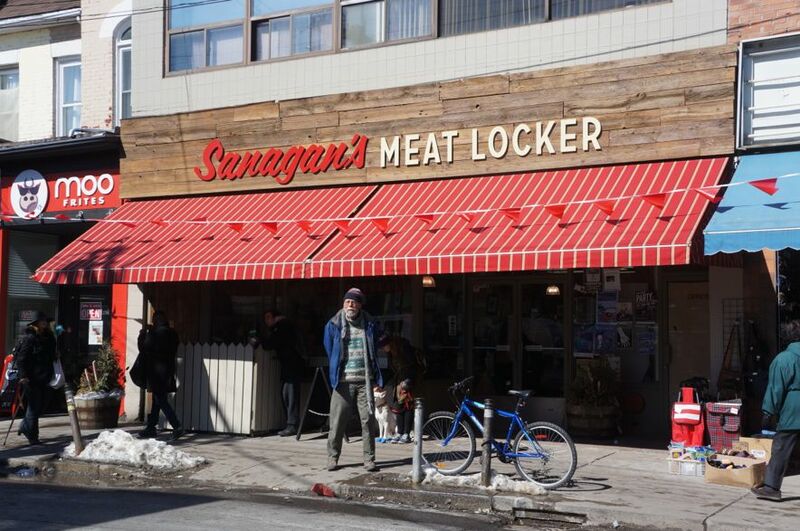 Located in the heart of Kensington Market is the beloved butcher shop Sanagan’s Meat Locker (@sanagans). While it’s primarily a butcher shop, they offer a whole lot more. 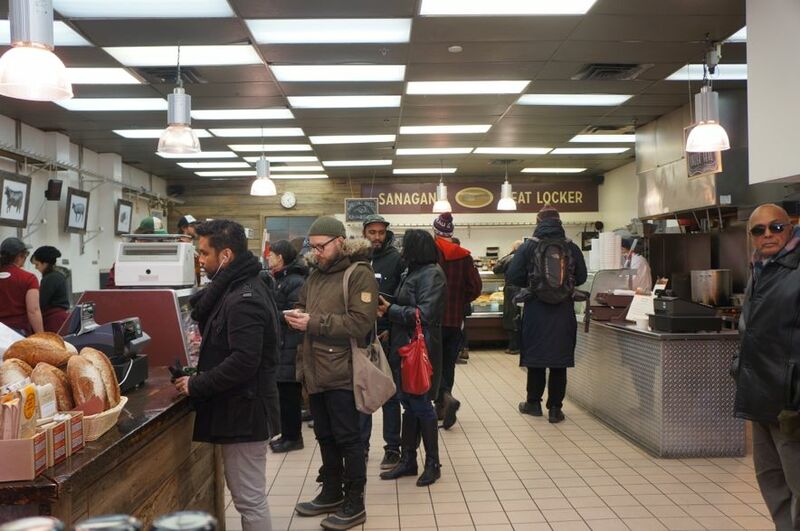 While spending an afternoon in Kensington Market, Mike and I popped inside Sanagan’s to grab a quick bite to eat. Despite the enormous 5,000sq ft space, the place is always packed which really speaks to their popularity. They’ve been at this location for a couple years now but they were previously down the street in a tiny space which is now home to Hooked. Sangan’s Meat Locker, which is owned by Peter Sanagan (who was a chef in his previous life), has great staff who really know their stuff – the source of the products, how the animals were raised, the best way to cook/prepare the meat, etc. So yes, you’ll pay more than at a no-frills grocery store but the staff are knowledgeable and the meat is carefully sourced. There’s an emphasis on small, local farms and hormone-free meats. 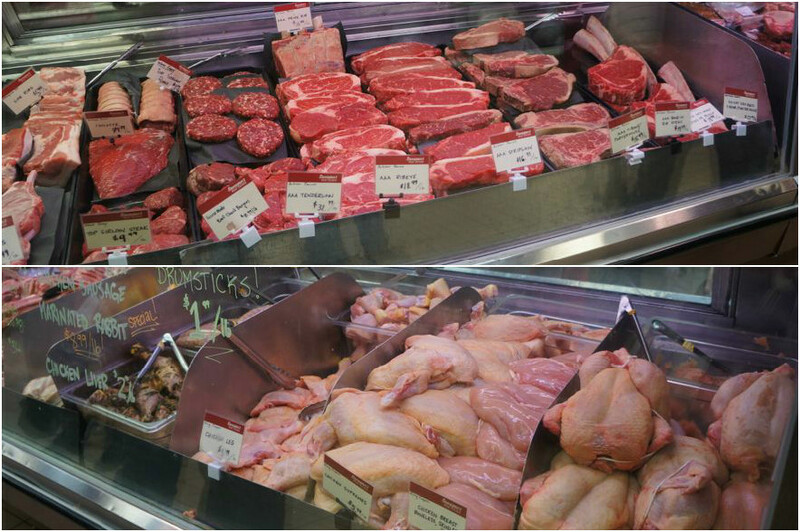 You can get King Capon chickens, West Grey Farms beef and Perth pork, to name a few. At the back of the space Sangan’s has a deli counter featuring cold cuts, tourtières, terrines and everything you need to build a lovely charcuterie platter. 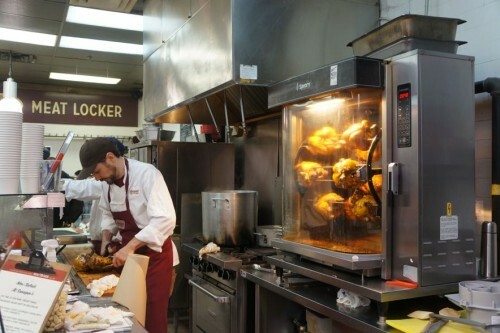 They also have a sandwich counter with rotisserie chickens and other ready-made food. It’s mainly a take-out operation but there are a handful of stools near the front of the space (which fill up quick!). The sandwich menu is short and sweet, with a daily special also available so keep an eye out. 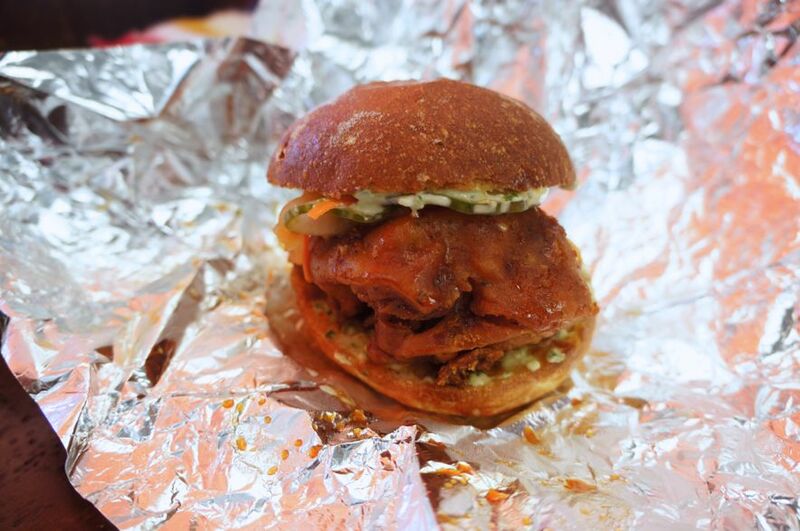 The one that caught my eye was the Korean Fried Chicken Sandwich – house made kimchi & pickles ($8.50) which is available with a white or whole wheat bun. The fried chicken had a fiercely crispy batter which gave the sandwich this great crunch while still maintaining a moist interior. I loved the spice level and the sauciness of it all – it’s a messy one! While I loved everything about this sandwich I felt it was a little light on the kimchi. 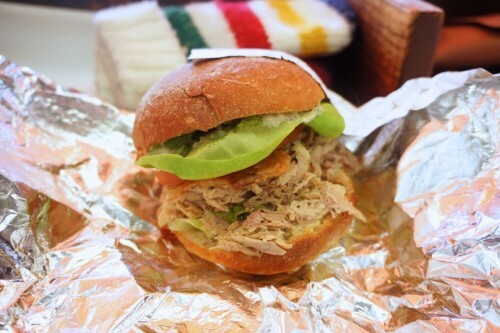 Mike decided to go with the Roast Chicken Sandwich – crispy skin & remoulade sauce ($8.50). The pulled chunks of roast chicken were nice and moist and we loved the addition of chicken skin crackling. It was another great sandwich but in all honesty, the fried chicken sandwich stole the show. 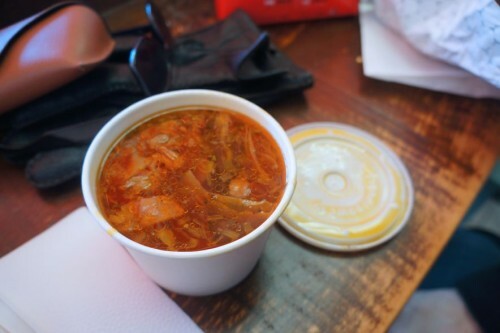 To complement our sandwiches, we shared a Scotch Soup (soup of the day) which consisted of barley, root vegetables and lamb neck. You can add a soup or salad to any sandwich for an extra $4 to make it a combo. As you can tell, this soup was on the oily side (it was made with lamb neck, after all) but the broth had a really deep flavour which definitely had a bit of a gamey taste to it. But I love lamb, so no complaints from me. We both really enjoyed it and would order it again in a heartbeat. Overall, we had a great experience at Sanagan’s Meat Locker. While it’s not the most comfortable space for eating in, their delicious sandwiches are well worth it. Do you know if there is any place in Calgary or, if not, Vancouver which sells capons? Just had one while visiting the in laws in Toronto and it was delicious. Sorry but I’m not sure!